Many food distributors have found that holding a Food Show for their customer base, along with vendor participation, is a great way to build their business, introduce new products and provide attractive buying options for their customers. The entrée.FS software module was created for the needs of food distributors who hold their own Food Shows. It works directly with entrée and if used, entrée.DSR (laptop based order entry for offsite entry of orders) to ensure customer orders taken at the food show are properly tracked, delivered, priced and fulfilled. You can also generate paper based "Food Show Worksheets" for your sales staff to write down customer order information to be later entered into entrée. The basis of any Food Show Order is each item's "Food Show Promotion" definition where you can define your promotions to be either discount-based or fixed price-based and also set a minimum quantity and a maximum including any any vendor Bill Back amount that is associated with the promotion. When creating or editing Food Show Orders, you will be asked to provide the details for the item including specifying the total order quantity which the customer wishes to purchase and the delivery schedule which allows defining as many individual deliveries as necessary. Keep in mind that the quantity entered is intended to specify the customer's requirement for an entire week. At the time of delivery the specified quantity may be divided over two or more different invoices (half on Tuesday and half on Friday, for example) so it is not strictly necessary to specify the actual delivery schedule in detail but you can if you wish to do so. If the customer's desired delivery schedule can be expressed in simple terms, such as '10 per week starting June 14th', you can save time by using the "Schedule Generator" tool. Since many aspects of the fulfillment of Food Show Orders are either automatic or can be handled by any or all of your order taker staff (adding items to invoices and specifying appropriate quantities), keeping track of your Food Show Orders can sometimes be a challenge. 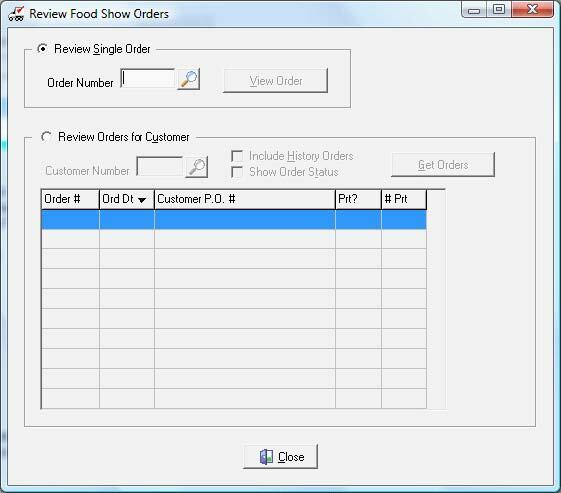 To help with the management of your Food Show Orders, the entrée.FS software module provides a "Review Orders" utility. This allows you to look at individual Food Show Orders in detail or just take a quick overview of the orders for a specific customer. In addition to the interactive review process, we have also provided the "Food Show Orders Report" which will give you more of an overview of your Food Show orders. 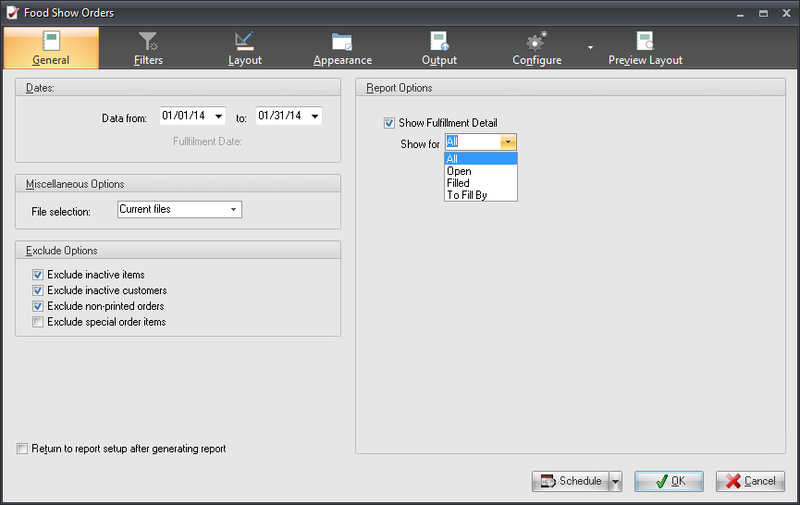 Here you can use the "All" option to list the entire delivery schedule, the "Open" option to list only deliveries which have not been fulfilled, the "Filled" option to show only deliveries which have been filled and the "To Fill By" option to look at all unfilled deliveries due before a certain date.